Ascending Butterfly: Thursday, January 28, 2010 - Today's Words of Inspiration, more hope for Haiti, and Great Giveaways! Thursday, January 28, 2010 - Today's Words of Inspiration, more hope for Haiti, and Great Giveaways! We temporarily interrupt your daily words of inspiration for a good cause! Our friends at The Sak and Elliott Lucca have joined forces with a great cause to help the people of Haiti. It’s Easy! Simply donate to Doctors Without Borders, between 1/27/10 and 2/10/10, and email your receipt from your donation to customerservice@shop.thesak.com and an email will be sent to you on 2/11 with your 25% off discount code. 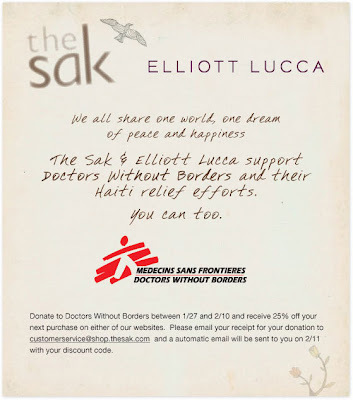 The Sak & Elliott Lucca support Doctors Without Borders and their Haiti relief efforts. Doctors Without Borders/Médecins Sans Frontières (MSF) is an international medical humanitarian organization working in more than 60 countries to assist people whose survival is threatened by violence, neglect, or catastrophe. There is a page on their website that focuses on the relief efforts in Haiti, it's called 'Haiti Earthquake 2010' you can get there by pressing HERE. (Don't forget to come back here for your daily words of inspiration!). When you get your discount code, I would highly suggest using it on one of the sakroots artist circle bags, these bags are helping to support The Nature Conservancy's Plant a Billion Trees Campaign. These bags are eco-friendly, stylish and also help support a good cause! This is a win/win all around, and the true meaning of 'power shopping'. It is truly inspiring to see the many ways the nation has come together to help the people of Haiti at this time. And remember it is the efforts of each individual that has been combined to make the whole, one person does matter, no gift is too small! Let's let the power we each contain within us be what we use to inspire us today. Realize just how important and powerful you are! Use 'Today's Words of Inspiration' as a breathing meditation to still your mind, quiet your thoughts and bring in positive energy. As you inhale bring in only positive energy by saying in your mind, I breathe in positive energy (or you can say creative energy if that is what you wish to create more of) and as you exhale, Affirm out loud today 'In day to day living and giving I make powerful choices. I am a powerful person. My efforts count'. Are you getting the dreaded 'Your Entry Can't Be Processed' message when leaving an entry or comment? Before hitting enter, highlight your comment and COPY it. If you get that message after hitting enter and your comment is still there, just ignore the message and hit enter again, then you will get a screen with a captcha code, enter the captcha code submit and VOILA. If after you hit the submit button the first time, you get the dreaded message and the comment 'disappeared' no worries, that's why I asked you to copy it in the first step. Paste it back in and submit again. This has worked for me when comment boxes have glitched on me, and I hope it helps you too!